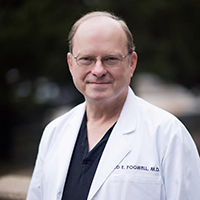 Ted E. Fogwell, MD, is board certified in Ob-Gyn. He is further trained in minimally invasive surgery and robotic surgery. Medical School: University of Texas Southwestern, Dallas; M.D. Dr. Fogwell is married and lives in Dallas. He has two married daughters and four grandchildren. He is Associate Professor Of Obstetrics-Gynecology at the University of Texas Southwestern Medical School, Dallas, and has been recognized in multiple publications as “Best Doctor.” Dr. Fogwell makes yearly trips to Guatemala, and Romania to provide medical training for physicians and medical care for the citizens of those countries.